Case Study: How to Light A Mayoral Campaign On Fire, AGAIN, Via Blog! Jenny Siebel Pours Gas on Self, Lights Lighter, Thinking She Rocks (She Doesn’t). Seriously. That’s all I could think of when I watched the latest iteration of Mayor Newsom’s mayoral meltdown, courtesy of his latest “girlfriend”, Jennifer Siebel. The interview itself was little more than self-serving gossip from a woman who clearly sees herself as the future Mrs. Newsom, and was eager to play the role of “First Lady of SF” in her first big interview. Reading it, you got the sense that it was all scripted, designed to put out fires caused by the Mayor’s past behavior, and perhaps rewrite history, Communist Russia style, to reinforce the meme that The Mayor Has A Stable, Monogamous, Heterosexual Relationship, and that Everything Is OK. Oh, and he’s Kind of A Victim, Too. Fine. But then my good friends at SFist.com posted some minor commentary on the piece. That’s when Jenny Siebel decided to take a can of gas, dump it on herself and the Mayor, and light her lighter, thinking she rocks – and ended up burning herself and the Mayor in the processs. The reaction of readers at SFist was unusually one-sided, and swift. Somehow, Ms. Siebel managed to make herself look rather mean-spirited, making some very nasty comments about Ruby Tourk along the way, resurrecting the story once again. By the end of the day, she’d managed to put the whole mess, plus more, right on the front page. 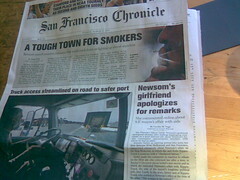 SFist.com was in the spotlight, thanks to Team Newsom’s mishandling of blogs – again. Meanwhile, the Blogger’s Union, Local 20-Deep had something to write about besides that pilot they’re filming in San Francisco today. Whee. In the end, however, the whole silly, sordid, made-for-blog chain of events did more to make me wonder just what the Mayor is doing with his time these days. When the whole shebang broke last month, I noted at the time it was “news” but that it was more important to gauge the Mayor’s behavior as it impacted his performance of the issues of the day. This latest flare up begins to make you wonder just what is going on these days in City Hall. One wonders – behind closed doors, are the mea culpas and the public praise of his former campaign manager all fake? I didn’t think so before, but thanks to Jenny’s online meltdown, now I begin to wonder. The most important thing to consider is How All Of This Impacts His Job – and as we go down the list, it isn’t looking good. We have serious problems at MUNI – and the best the Mayor can offer is some feel-good candyland foolishness you’d expect from the far left. We have crime out of control and we hear platitudes and words of concern – but no action. Businesses begin to wonder if the San Francisco of the 2000’s is morphing into the bloated, ineffectual and ultimately disastrous New York of the 1970s. The whole “Poor Gavin is a Victim” meme is getting old, too. What makes this all amusing is how caustic the “powers that be” were in telling SF voters if they voted for that crazy Matt Gonzalez, we’d have out of control crime, piles of new programs and candyland ideas placed on the backs of local business, and a Mayor who was not mature enough for the job. Funny thing, many people did vote for Crazy Gonzalez – and that’s exactly what they got. But Gavin need not worry. No one is willing to put forth a credible candidacy now, or anytime soon, so despite all the blogfoolery, he’ll skate by. He won’t have to talk about issues and everyone can reap the benefits of four mor years of MUNI messes, crime, and more. The local bloggers will have more grist for the mill, and all we’ll have to do is dodge bullets on the way to the late MUNI bus.